Feb. 08, 2019, ©. Leeham News: In our run through of the pitch stability problems of an airliner we covered high and low-speed problems in the last Corners and before it deep stall. Now we go back to the region just before and during a stall, to look at more measures to help the pilot besides stall warning and stick pushers. Figure 1. A thought pitch moment curve for Boeing’s 737 MAX. Source: Leeham Co. The stall is a dangerous area of the pitch envelope. The wing’s aerodynamic flow breaks down to an unstable flow which is easy to influence by outside factors. Despite a lot of investigations during the creation of an airliner using CFD (Computer Fluid Dynamics tools) and wind tunnels followed by flight tests, it can still go terribly wrong when an aircraft enters stall. The flight test investigations are made with a number of cases, but for a commercial airliner, no flight tests are driven into a deeply stalled state. An unfortunate stall entry can have a lot of pitch and yaw inertia pushing the aircraft deep into stall with an asymmetric aerodynamic flow situation. This is a recipe for a spin, a dangerous rotating stall with asymmetric flow over the wings, and it takes a long time to get out of a spin. Fighters go there during their flight test but they are made for flying on the limit and the pilots have an ejection seat just in case. Airliner’s whole business is to bring their passenger to their destination with a maximum of safety, this is what their design and testing teams focus on. Thus airliner designers focus on helping the pilots not to enter stall and the certification process has strict requirements how the airliner shall behave in the region before stall entry and during stall. Figure 1 shows an airliner flying at a trimmed Angle of Attack (AoA) of 9° like it does just before landing (green line crossing the zero moment line at 9° AoA). If the pilot for reasons of an emergency has to do a tight turn when on the approach, the aircraft comes into the light grey area of AoA. Here the aircraft shall have the same yoke force resistance to increasing the AoA as before. It shall not suddenly be easier to pull the nose up (red curve). The 737 MAX was a bit too easy to pull into a stall when flying with high AoA and making abrupt maneuvers. The larger engines for the MAX hung further forward from the wing, added a destabilizing aerodynamic area ahead of the center of gravity, destabilizing the pitch moment curve at high AoA. Boeing and the certification authority, FAA, decided added margins was called for. Boeing added a pitch augmentation at high AoA called Maneuvering Characteristics Augmentation System, MCAS. The aircraft should trim nose down to increase the stick force needed once it passed into the light grey area where the base aircraft had a region of less stability. Before the augmentation, the pilot felt if the aircraft wanted to fly into the stall, it got easier to increase the AoA after 12°AoA. With the augmentation the felt extra force was the same for the first and last part of the curve before the maximum lift was achieved at stall (and stall warning kicked in). The fault checking of the triggering AoA signal was not rigorous enough. This problem has been discussed a lot. No need to add anything. The judgment the pilots would identify a problem with the augmentation as a trim runaway and shut the trim off was wrong. Why the pilots didn’t see MCAS rouge actions as a trim runaway is poorly understood. As described in the previous Corner, 737 pilots are used to the aircraft trimming in the background both in manual and autopilot flight. They feel the trimming in the yoke when flying manually and see the trimming of the autopilot on the rotating trim wheel in the cockpit. MCAS behaves the same once it’s activated. The only pilot which commented on background trimming during the three previous flights (which all seemed to have had the same problem) was the Captain on the Denpasar to Jakarta flight, the one before JT610. And he saw it as the normal trimming being confused by the speed and altitude measurement problems. He wrote in his log “ Airspeed unreliable and ALT disagree shown after takeoff. Speed Trim System also running to the wrong direction, suspected because of speed difference”. He shut off the trim because he thought it better this way, but he did not identify the problem as a trim runaway. He thought it was Speed Trim working off bad information. Therefore he didn’t report trim runaway to the mechanics nor to his colleagues after the flight. Nor did any other of the five pilots who flew with the problem before JT610. We can see how the fact the pilots were used to the aircraft trimming and the MCAS not behaving differently masked to the pilots the aircraft had a new system which could go wrong. The action to take for the unknown problem was not obvious. If it would have been, the six pilots before the fatal flight would have reacted, they didn’t. To introduce MCAS was logical. Its reliance on a single signal trigger was probably accepted because the system covered a remote corner of the flight envelope. The action to counter any faults was deemed obvious. In practice, it wasn’t. Exactly, the training in the simulator of Trim Runaway is with a hung switch or such, causing the trim to run continuously in one direction. MCAS is behaving like a Speed Trim a bit off in its schedule, a controlled if a bit confused function in the background. Are you saying that there is no training for dealing with malfunctions in the Speed Trim, presenting as repeated (not continuous) erroneous trim corrections, or malfunctions in the Mach Trim? It seems to me that if the aircraft is persistently trying to trim down, when it obviously shouldn’t, the first course of action would be to shut off the trim, especially after fighting the aircraft for several minutes. Mike B: Its also logical per previous that pulling back on the yoke breaks that. Runaway trim would not respond to that input. And not knowing there was a new feature that could do that lends further confusion. The same thing can be said about the flap position stopping it on the last flight. Even if I was confused, if I had it stop, then I would leave the flaps down and back to airport. Does Lion push the pilots to keep going ad it appears to be from 3 flights? Seems so. Not all people act with logic. Most in fact do not, the logic is by rote procedure not built in. As we have seen, even large commercial jet pilots are capable of some amazingly stupid things. The Asiaina crash had Boeing’s auto throttle feature with a name, they called it an FLCH Trap. You know you did a stupid design feature when it gets a name like that. So, don’t put pilots in that position in the first place,e, commercial flights are not supposed to be a testing lab for human actions. Boeing screwed up big time. 1. No cross link to ensure this feature kicks in – that is plane stupid. I work with Halon and you never do a Halon release with a single fire alarm input, it has to be two. There is no quesiton Lion air, its safety culture (lack) as well as the pilots are not top grade. But its also clear you know where these airplanes serve and how good the pilots and safety culture are, you should not kill a plane load of people over something that stupid. Auto throttle should come back in if you are about to hit a stall as well. the problem is we are in aftermath and armchair piloting the aircraft with full knowledge of the fact MCAS was there. For me, who has “been there,-done it”, the fact that six pilots on three previous flights do not write up “Trim runaway” and/or “Used the trim cutout switches” to the mechanics or colleagues flying after them says it all. They all had thousands of hours in the plane, hundreds of simulator emergency training sessions behind them, all with trim runaway and other trims faults. And NONE, NO-ONE tells the mechanics or colleague pilots there is a trim situation where you shall use the trim cutout switches. One uses it after playing with it but he deems it not important and relevant information as he’s not reporting it after the flight. We can sit in our chairs and theoreticize as much as we want, for me, this is the key indicator it was not obvious. Zero out of six is a pretty convincing statistical sample. but was in the loop all the time. ( point from #8 ). I’d be surprised if this distinction wasn’t available to Boeing engineers. Only Boeing and FAA know why there was no checking of the trigger for MCAS. Given its ultimate power, some checking of the trigger would have been warranted. Any idea if the new tail cone design has a stealth purpose too beyond the one offered i.e. (very) minor drag improvement? … like improving rudder authority in problematic attitudes? What remains is that MCAS appears as a listlessly stuck on gimmick “to get it out the door”. fix up later. Obviously the main purpose of a sleek, reshaped tail cone is to attract airline suitors. Boeing had to do a number of things so the 737 Max could ‘make its numbers’. yes , the minor drag reductions here and there add up. I’d guess this also improves on air flow along the tail aero surfaces? 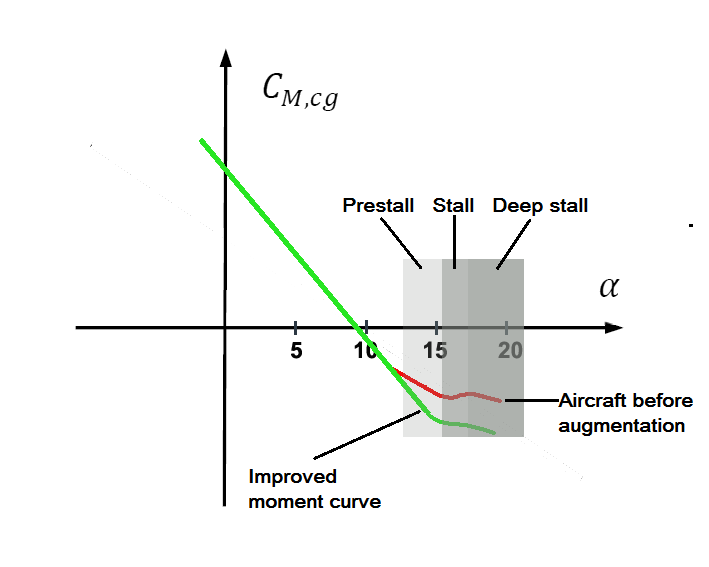 … improving controlability in the corners of the flight envelope? A very interesting corner as usual. It would be very interesting to see pitch moment curves for the 737 NG, A320, and A220 in comparison to the 737 Max. Due to the fly by wire nature of the A320, and A220 a comparison of the pilot/aircraft/software actions in the region approaching a stall on these aircraft would also be interesting. With the increase in engine fan diameter from A320 to A320NEO, and indeed the difference in fan diameter between the Leap, and the PW GTF, how has Airbus handled the difference. I understand that with the A320NEO it wasn’t necessary to place the engines further forward, and higher on the pylon, but I am assuming that the greater diameter of the fan would have some effect on the handling when the aircraft entered a high angle of attack ? the modern fly by wire (the real ones, not fly by electrical wire) are feedback designs. This means they created an ideal pitch feel to pitch AoA curve even for a base aircraft with kinks in the pitch moment curve. This is the beauty of real FBW but it then forces the full measure of redundancy as you are relying on the FBW being operational at all times. In the backup (direct) mode the aircraft has to have an acceptable=non dangerous curve, but the requirements are not as stringent as for the main curve. For the 737NG you can assume it looks like the green curve. I read somewhere that the MCAS is not operational with the flaps down, so it applies to the non flaps down realm of flight? When would the 737 be flying at high AOA without flaps down? Besides a turn, are there any other external forces which push the aircraft into higher AOA, gusts? Boeing lets you do that to a stall. Airbus in normal control law does not. The nose won’t go any higher (nor a turn any tighter) than the program allows. Boeing by its own take on controls requires that this be in place because the pilot can put it into that region. That makes sense, higher G, higher AOA to oppose that force with higher lift, thanks. Per the South Americn 757 (Americna?) theyu got themselves into mountainous, a steep pull up would be your only chance to clear a peak. The issue then becomes does the pilot control that or a computer? A computer can avoid the stall, pilots feel as we are seeing is majorly impacted by all the fine sub tuning going on. Ergo, it would keep a pilot from stalling the aircraft in that situation as well. We had a C-17 crash at Elmedork AFB (a few miles North of our house). The pilot was working at an airshow demonstration. He had done it before, kept pushing the boundaries and did a climbing turn stall and no room to recovery. He kept pushing further into the coffin corner till it killed him, two others on board and lost us a 200 million dollar aircraft. The notion that a pilot can feel what a large jet is doing is not correct (Bjron can tell us about fighters) but the computers can determine just how much you can get away with including density, G forces, AOA, Airspeed. Just to be clear, I did not say they stalled, its an example of where you could stall. Sadly too late, I am puzzled as I don’t think 757 has speed breaks but use the Spoilers. You would think those would drop out automatically if you did a throttle push. Will have to see if I can dig up the report. Yes, the speed brakes are the spoiler surfaces. But in that circumstance a FBW system would help. It would allow you to go into a steep climb , but without stalling. Maybe it would reconfigure the spoilers for maximum climb rate as well, as the control laws would pick up the plane wasnt manually configured properly. Twins like the 757 normally have heaps of power from both engines and should be able to do some steep climb rates. That “link” is probably a comparable misleading feature to the stall warning on/off (via the valid speed) for the AF443 crew.